This is the day when writers all over the land join together to write for five minutes, just five minutes, on the same word. And then we meet up at Lisa-Jo’s online space to share our words with each other and spread encouragement around the interwebs. If you want to give it a try, find us at http://www.lisajobaker.com. This week’s word: hero. Here’s to the Moms. The young ones, the old ones, and all those in between. The ones who sit up with sick kids all day and all night. Who wipe noses and bottoms, soothe boo-boos and hurt feelings. The Moms who get up every day and go to an outside job, and the ones who work at home. All of them on duty 24-7. You’re everyday heroes, all of you. The Moms who find motherhood comes naturally and fits as comfortably as a broken-in slipper. And the ones who come into motherhood wide-eyed and head-spinning, wondering just what planet they landed on and how they got there. And all the ones in between, who sometimes feel the perfect fit of their calling and other times chafe against what can sometimes feel like a straightjacket. Those with one kid or 15 kids. The ones who try their best to mother, who lay awake at night praying for their kids, who worry over very little detail. The ones who fail every. single. day. but keep getting up to try again because whatever else you feel, you love your kids with abandon and because of that all-encompassing love you can’t help but want to be the best Mom you can be. I think this is going to need to be re-visited in another blog post, because I didn’t even get to the Dads, and they totally deserve some recognition. I’m a couple of days late, but who can tell when inspiration will strike? I have a houseful of people here this morning and I’m serving canned cinnamon rolls for breakfast. And that’s OK, because I’d much rather “visit” with them then spend my time in the kitchen cooking breakfast. Cooking for friends and family is a kind of love, that’s true, but right now I want to show a different kind of love. I grew up right here in the South and have lived here all my life. When I was a little girl, my parents would often take me out on occasional “visits” with them. (I was an only child so I got dragged a lot of places we probably wouldn’t have gone if I was one of two or more kids) And when we got to whatever home we were going to, we would then sit and “visit”. There’s probably a better term for it, but “visit” meant that they sat and talked. In the same room. Made eye contact. Connected. Shared what was happening in their lives. Laughed together. Cried and prayed together. In modern parlance, they were “present”. I’ve been on longer visits to homes (and sadly hosted a few) where the household’s daily rhythm didn’t change. The guests were just spectators to a show that didn’t even take an intermission to acknowledge their presence. And while that may make the company feel like they’re part of the family, I think it defeats the purpose of a visit. I think you go to be with people in order to actually be with them, not just pass by them in the hallway. So if you come to my Southern home to visit me, don’t expect a meal from a Top Chef winner. I’d rather spend my time sitting with you on my couch, so you can truly say you’ve had a “visit”. So here’s the deal: every Friday some of the bravest writers on Earth get together and write like we used to do – for fun – for five minutes. No editing or overthinking, just five solid minutes on one word. Want to play along? Get on over to http://www.lisajobaker.com for all the information. I live a crazy busy life. I know this because my friends tell me so, and also because I can feel it, that whirlwind of running too many directions at the same time. I’m always going – either going somewhere or “going” to do something, usually the next thing on my never ending list. And yes, sometimes (OK, most times) I feel the need to slow down but at this particular phase of my life there is no slowing down. We’re in the midst of an interstate move, with one spouse in the “new” state and me still here with the kids, trying to work a part-time job, ferry the kids where they need to be, and just generally hold the house together during the workweek. In the middle of all this craziness it can feel like God is nowhere near. I’m so focused on what needs doing next that I can’t seem to “Be still and know that I am God” and I know that I need to do that very thing. But when those times come that I wonder where God can possibly be in the madness that constitutes my life, He has ways to remind me. A Voxer from a lovely friend from across the Northern border. A text, just asking how I am. God uses His people to reach out and let me know that yes, He’s there in the wildness too. He speaks in their voices, through their fingers, to tell me to keep going, that it’s going to be OK. That He’s there. Don’t underestimate the power of an encouraging word from you. It might feel like cool water to a thirsty soul when all they can see ahead of them is more desert. If God brings someone to your mind, maybe there’s a reason. And if you reach out to them in obedience, you might just set off a wildfire of encouragement that could one day light up the world. Truly, I am not sure how this happened. Two of my three daughters are quite athletic, yet we’ve never had a broken bone in our household. None of our three kids has ever had a serious illness requiring hospitalization, and I know how blessed we are to be able to say that. Somehow, though, I’ve managed to raise a couple of hypochondriacs. When I was a little girl my family didn’t always have health insurance, so I was only taken to the doctor if it was something pretty serious. I’ve always tried to be a good steward of our health insurance and I don’t take my kids to the doctor’s office for every little sniffle or twinge, but I also don’t wait for them to be completely miserable before seeking medical advice. That’s one reason I’m so mystified by the two of mine who think every sneeze is an indicator that pneumonia is right around the corner. This is the arm of my 9 year old gymnast. No, she is not injured. This girl uses a pair of crutches as fashion accessories. (I should have added a picture of those. They are a work of art, covered as they are in printed duct tape.) Lately she has been studying You Tube videos on how to make a realistic looking cast. She won’t sit still for much of anything else, but she’ll sit on the couch for an hour at a time wrapping and unwrapping her arm/wrist, and begging me for an old sock she can cut up and use as the base of her “cast”. And then it’s, “Take a picture, Mom!” and next thing you know, here we are with her arm in a fake cast in front of the Christmas tree. (Those are my festively socked feet you see at the bottom) She treats it like a hobby or something. 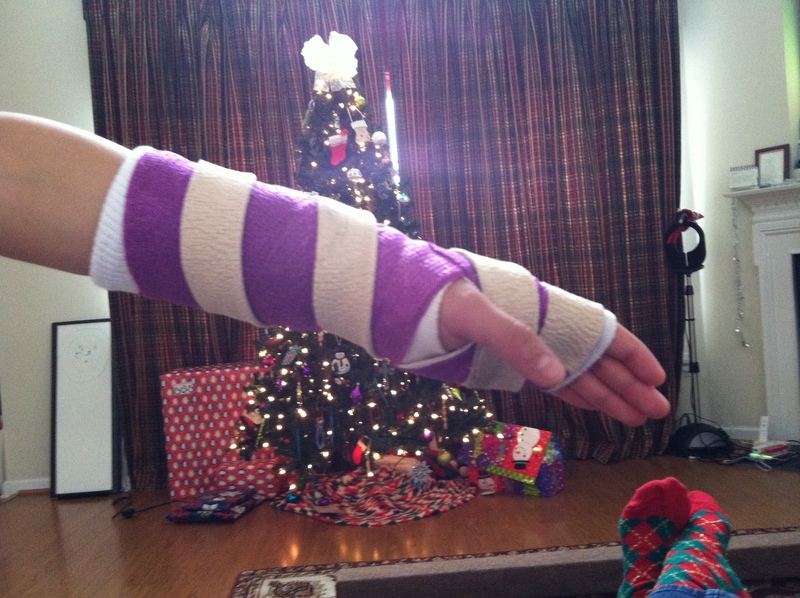 I do have to admire the way she used two colors of wrap to make this one look like a candy cane. Very creative! I’m not sure I get the attraction unless it’s just the lure of extra attention, and before you ask, no, I don’t let her wear it to school or out in public. It’s not like we don’t give her enough attention at home. I think it may be that she sees other kids with legitimate injuries getting some “cool” points, and she wants in on that action. And part of it may be that she’s just trying it out to see what it feels like. Maybe there’s something about being the “baby” of the family that makes her want to be the center of attention. But I shouldn’t point fingers at my kids. It’s probably not fair coming from someone who once used a whole bottle of Elmer’s glue and half a roll of paper towels to create an amazingly real looking cast on her finger, all in an effort to generate sympathy after falling off the merry go round at recess. In my (admittedly dubious) defense, I was also trying to stir up some remorse in the kids who caused me to fall off after I told them to slow down because I was sliding off the seat. And it worked! They totally believed the cast was real! Don’t judge too harshly – I was in third grade at the time. Anyway. Apparently the apple doesn’t fall far from the tree. And if she does fall, you can rest assured she’ll be sporting a fancy cast whether she needs it or not. Today I’m joining up with my friends over at Crystal’s place for Behind the Scenes, a fun link-up where we tell the stories behind the pictures. Come play with us! That’s what Moses told the Israelites just before they crossed the Red Sea. But who can be still when there’s a fight coming? Aren’t you supposed to rise up and fight back? Is it true that anything worth having is worth fighting for? And oh, the rush of adrenaline that comes from knowing you’re right and having the chance to press your point to a worthy opponent! And I like to win. I know when the “girl drama” is going on with one of my daughters and I advise her to walk away from it, I may as well tell her to flap her arms and fly to the moon. Neither of those is likely to happen. We want to engage and advance our side of the argument, don’t we? Don’t we deserve to be heard? We can’t be seen as surrendering! In case you’re wondering, “girl drama” doesn’t end when the girl grows up. I’m sure you’ve seen it yourself. It may as well be a fight even if the weapons used are words and manipulation instead of punches and kicks. But then there are the times when it seems like a battle to even get out of bed and face the day. Or my kids decide to be difficult, or someone has done or said something that offended me or hurt my feelings. Nothing, nothing is going my way. On those days when every. single. thing feels like a fight and I’m perpetually on the losing end, surrendering still feels like winning somehow. It’s my choice and I’m choosing to walk away from the fray. I’m stepping away and being still. I’m letting the Lord fight for me because I just don’t have the fight left within me anymore. What about you? Do you engage when a fight shows up at your door, or do you walk away? Today I’m joining up with some of my favorite wordsmiths on the planet for Five Minute Friday. We get our one word prompt at midnight on Friday, then we write for five soul-freeing minutes. Want to play along? Go to http://www.lisajobaker.com for all the details.